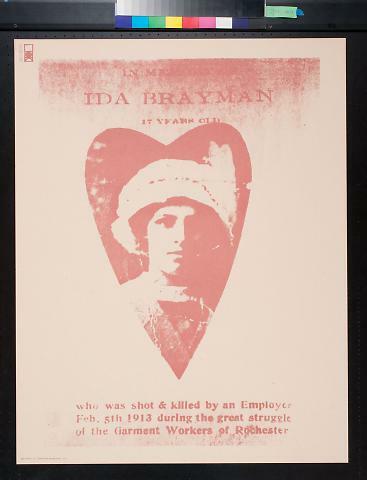 inscription: Lower left corner of the poster has the text: "IDA TCP-8 (c) 1970 Times Change Press" with a small logo. Upper left corner has the text: "Times Change Press / 1023 Sixth Ave. N.Y.C" with a large logo. Poster is printed overall with what appears to be a reproduction of a newspaper obituary. The top of the poster has the text: "In Memory Of / Ida Brayman / 17 Years Old". The center of the poster has a heart shaped photograph of a young woman in a large white hat. The bottom of the poster has the text: "who was shot & killed by an Employer / Feb. 5th 1913 during the great struggle / of the Garment Workers of Rochester".